Gotham Wines was established as a Negociant wine business in 2004 and in a little over 10 years has evolved to become a collection of wine brands enjoyed around the world to great critical acclaim. In late 2013, Gotham Wines found a home base at their winery in Langhorne Creek and has flourished ever since. Gotham Wines produces outstanding value for money wines under the unique and quirky Wine Men of Gotham label and distinctive premium wines under the dark and mysterious Gotham Wines brand. Gotham Wines offers superb quality at all price points – a quality recognized and enjoyed at home and across the globe in North America, Europe and throughout Asia. Gotham Wines takes its name from the mystical name for New York City. It was the great American writer Washington Irving who first named New York ‘Gotham’ in his 1807 periodical, The Salmagundi. 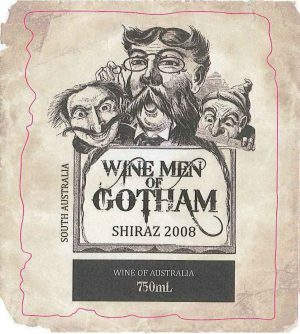 Gotham Wines aim to produce the best value wine money can buy, led by our many Shiraz wines famed for their black ink colour.